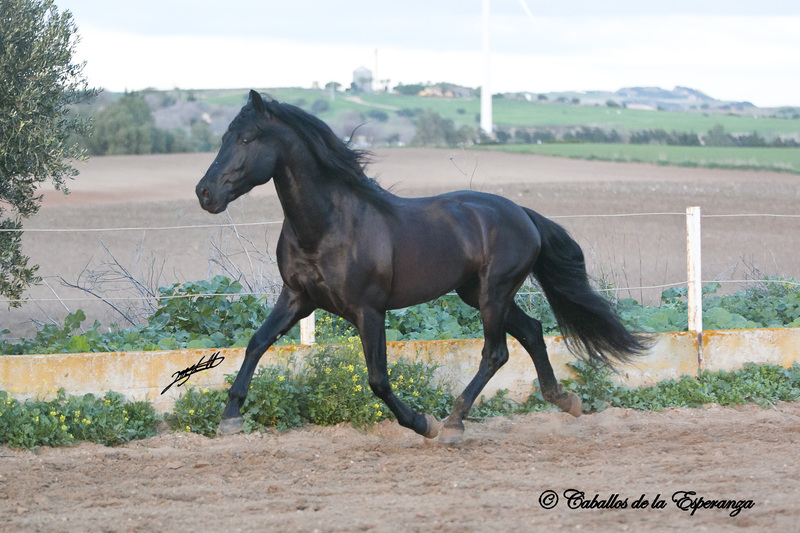 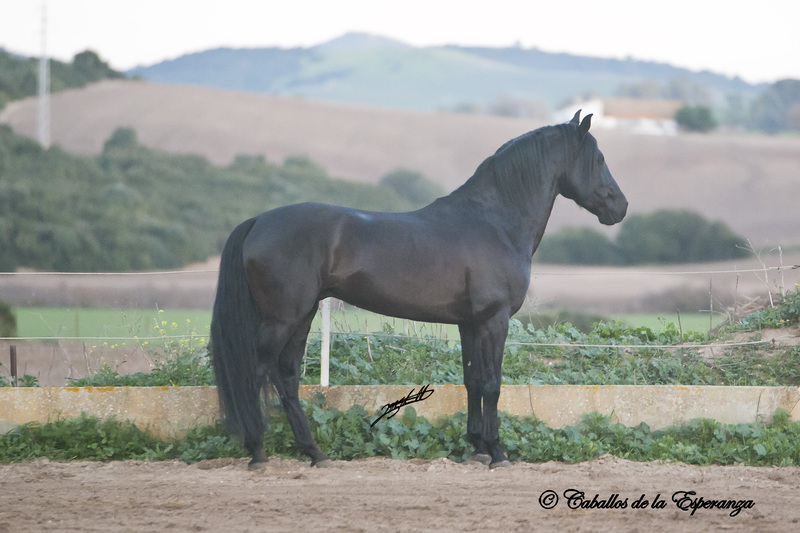 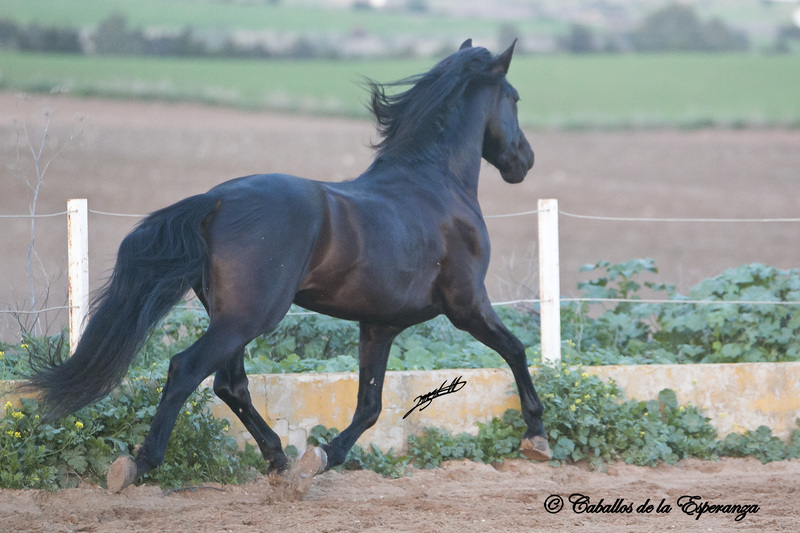 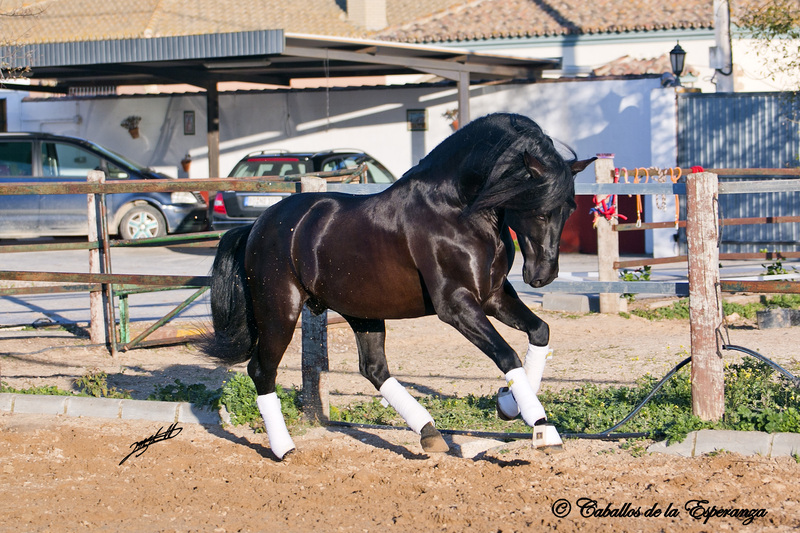 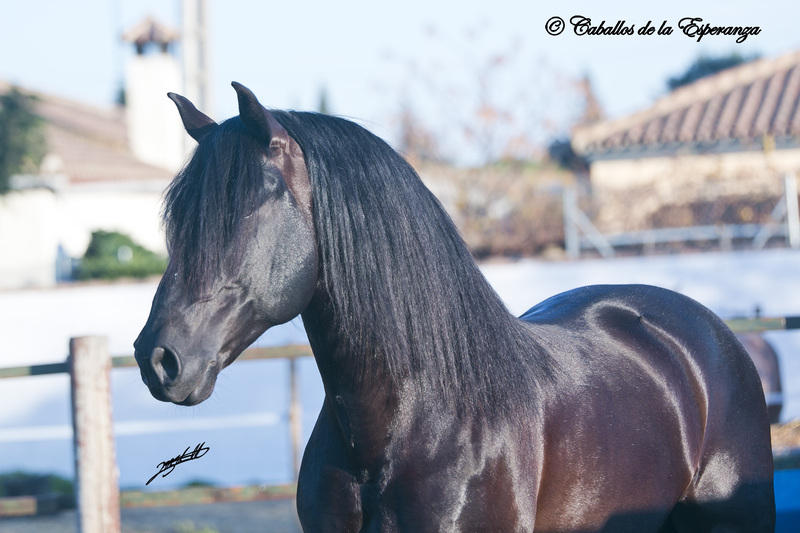 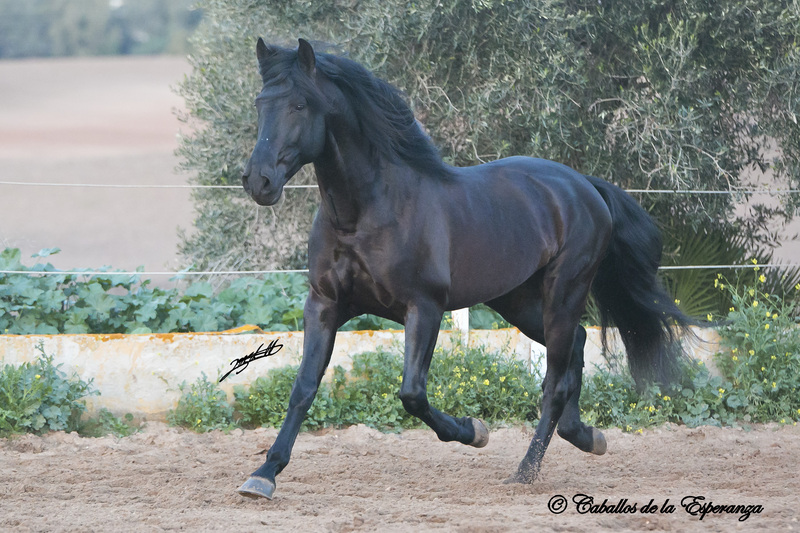 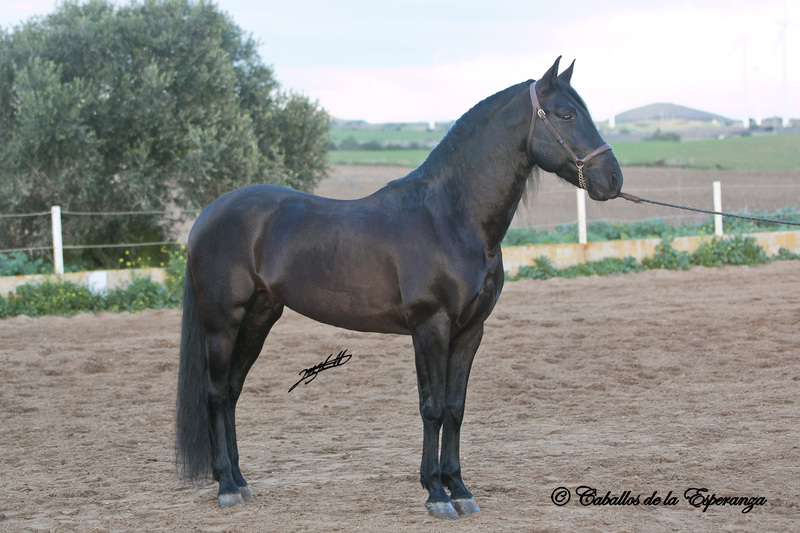 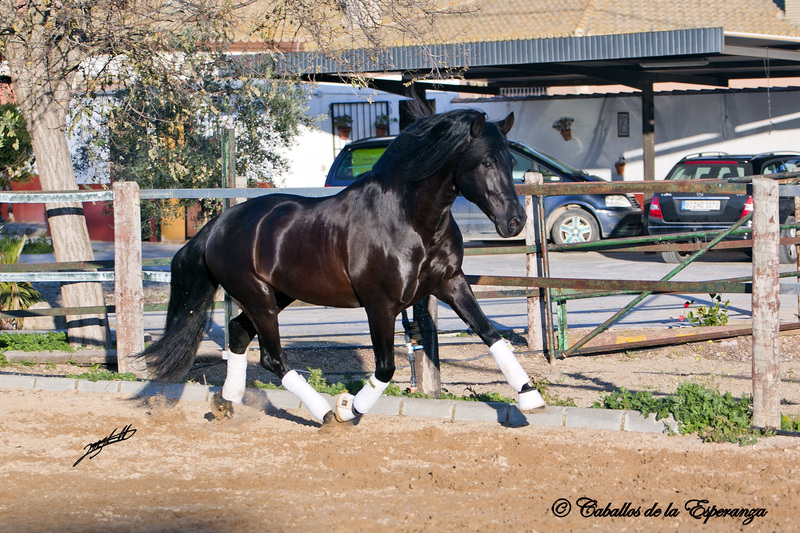 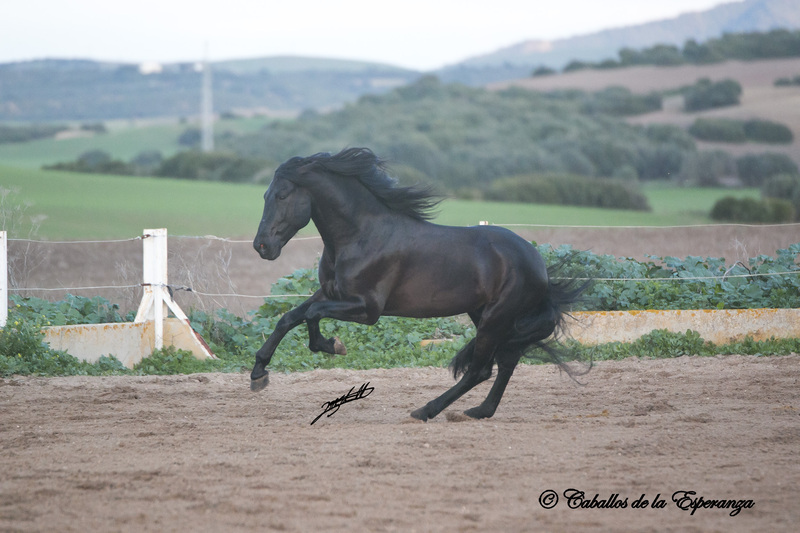 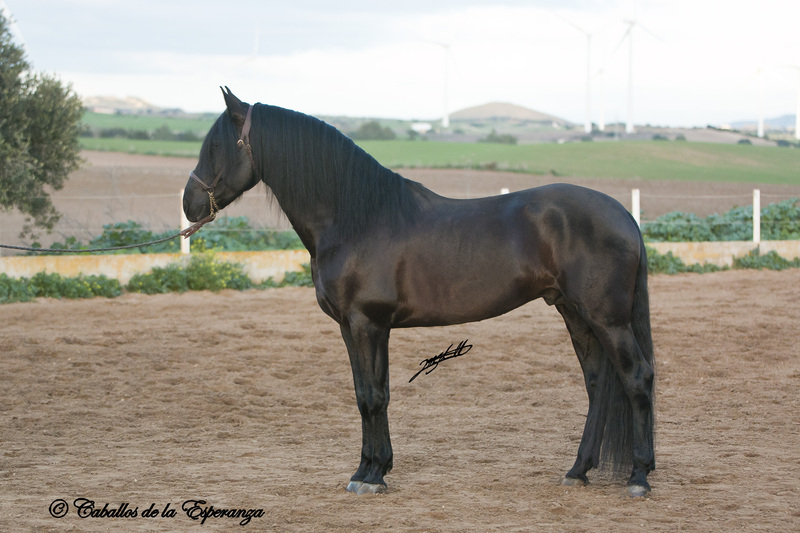 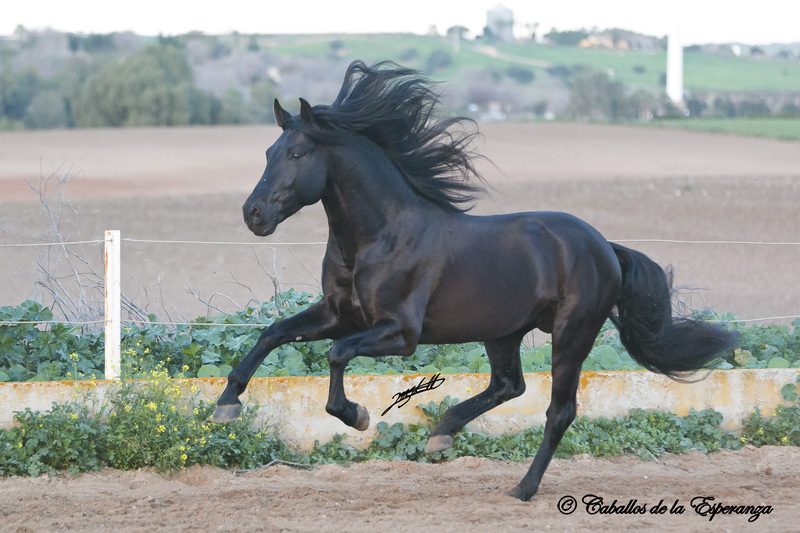 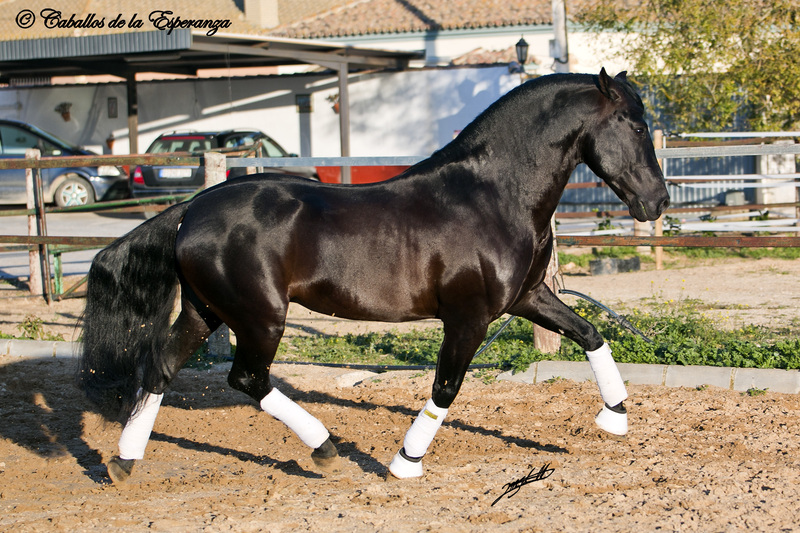 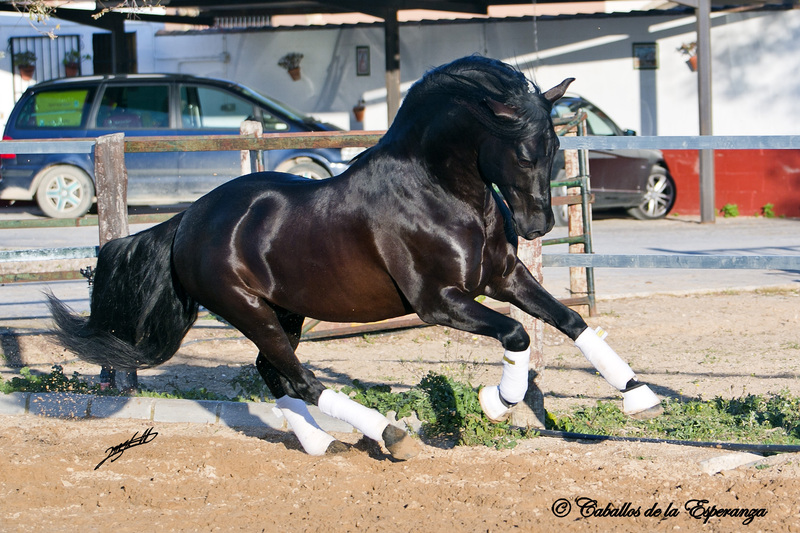 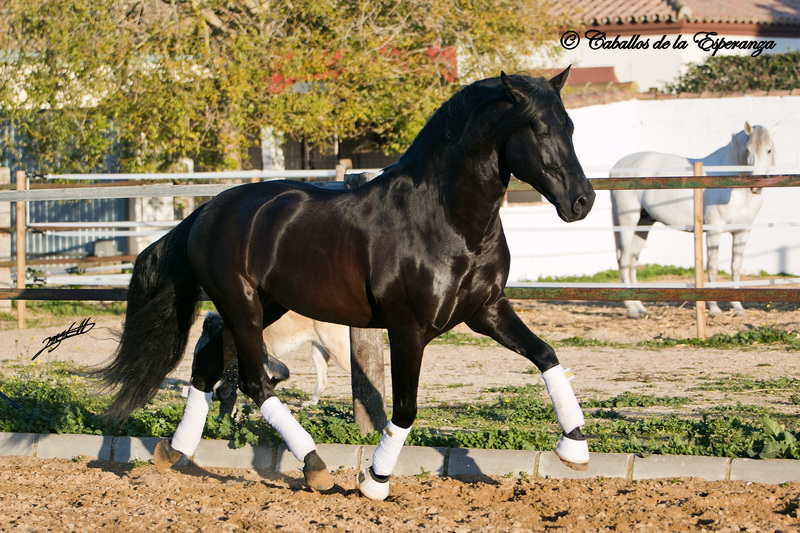 Black dream-stallion like out of a picture-book. 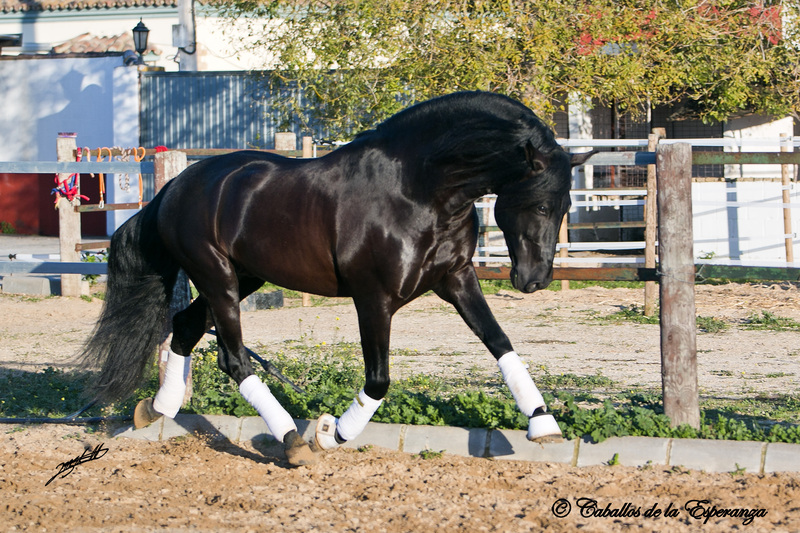 Spectacular charisma and TOP character! 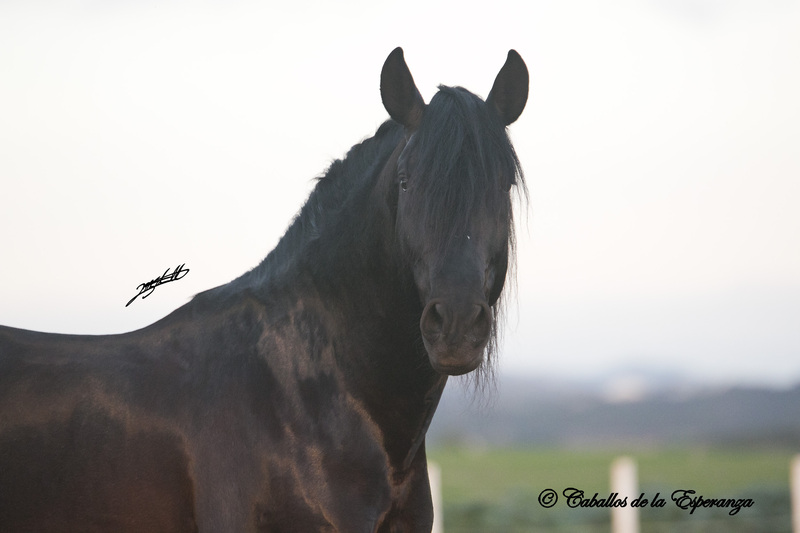 With a heavy heart I’m looking for a new home for my Distinguido. 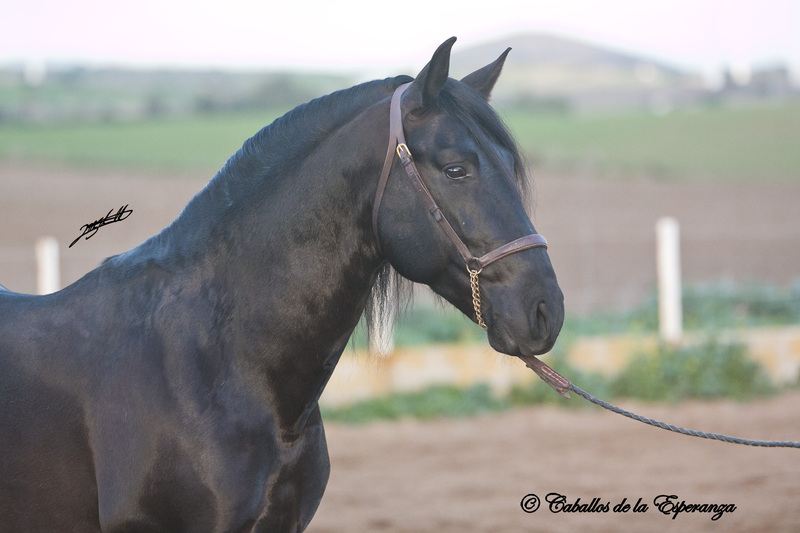 He is super sweet-natured, likes to cuddle and loves everything you do with him, always staying the coolness itself. 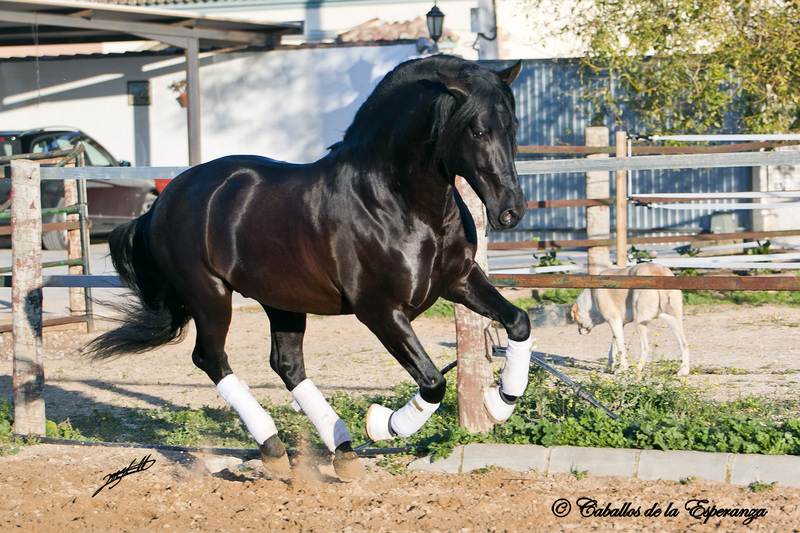 When encouraged he shows all his temper. 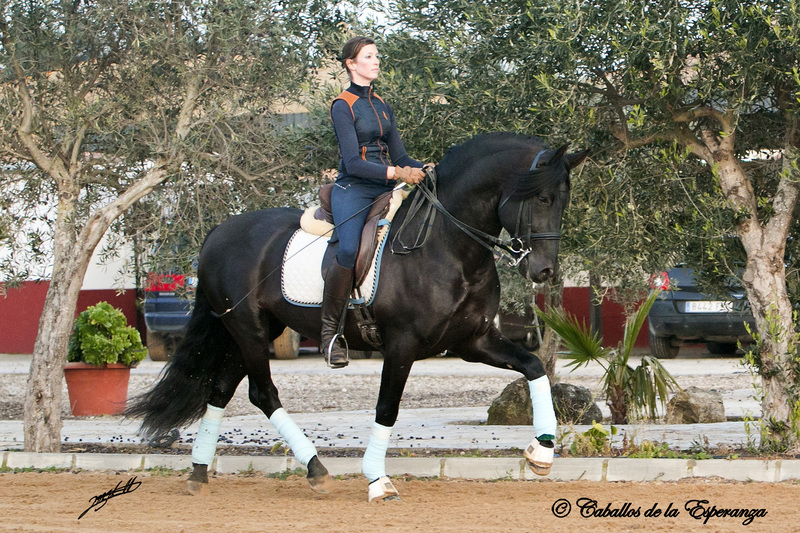 So you can either hack with him relaxed in walk, or work dressage with him in the track. 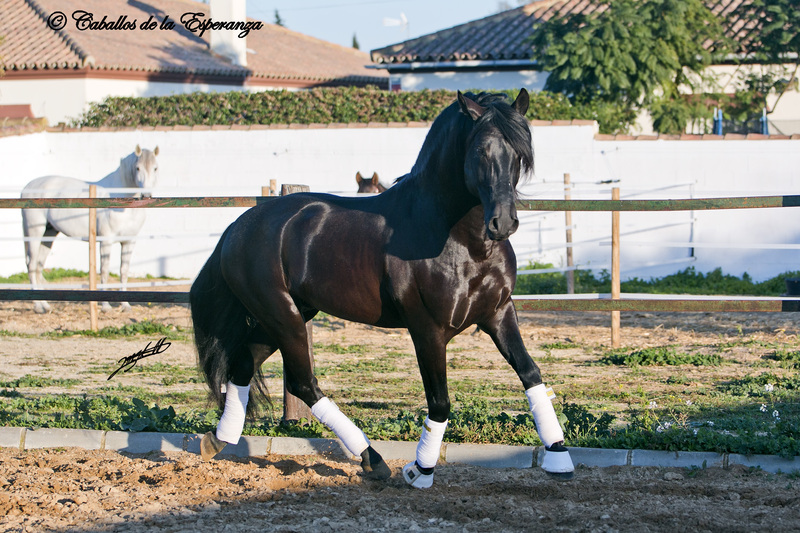 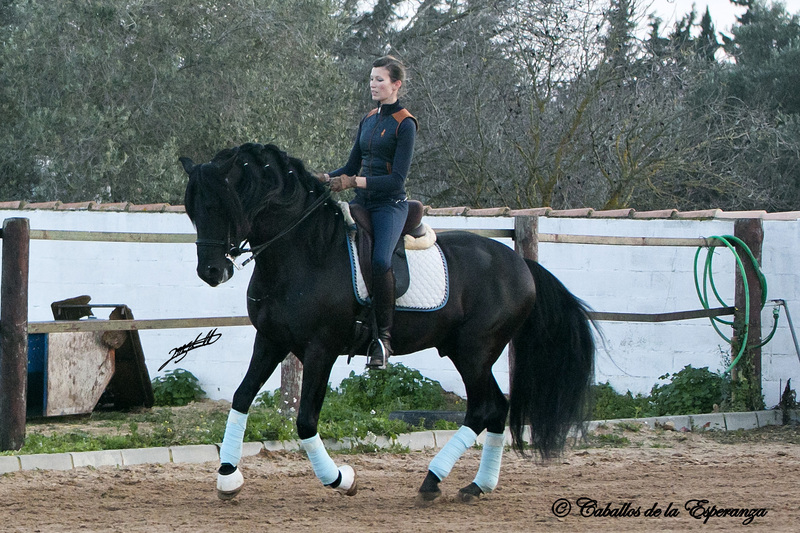 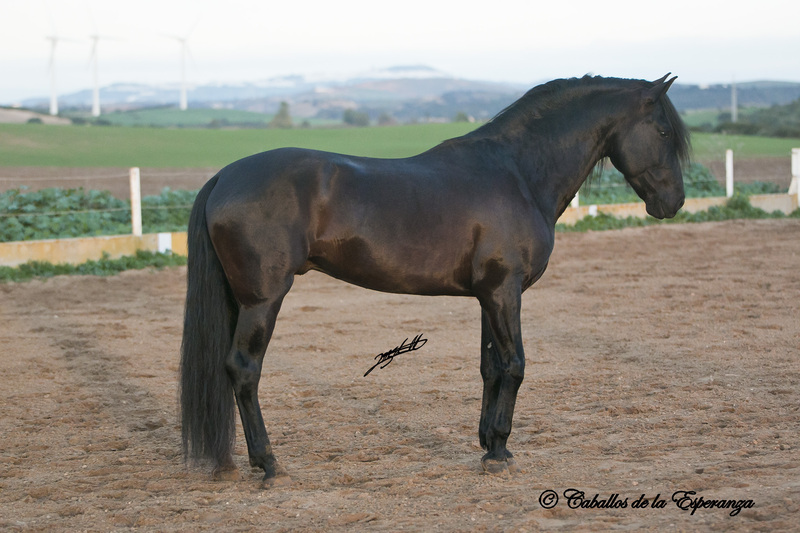 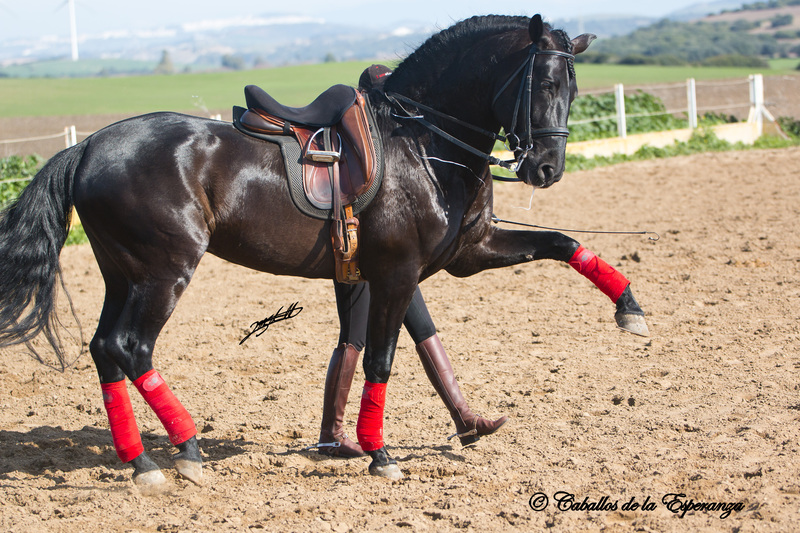 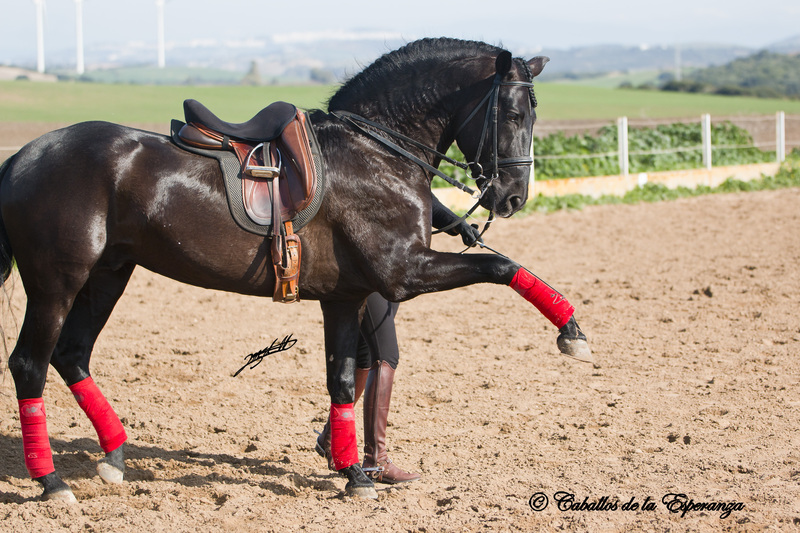 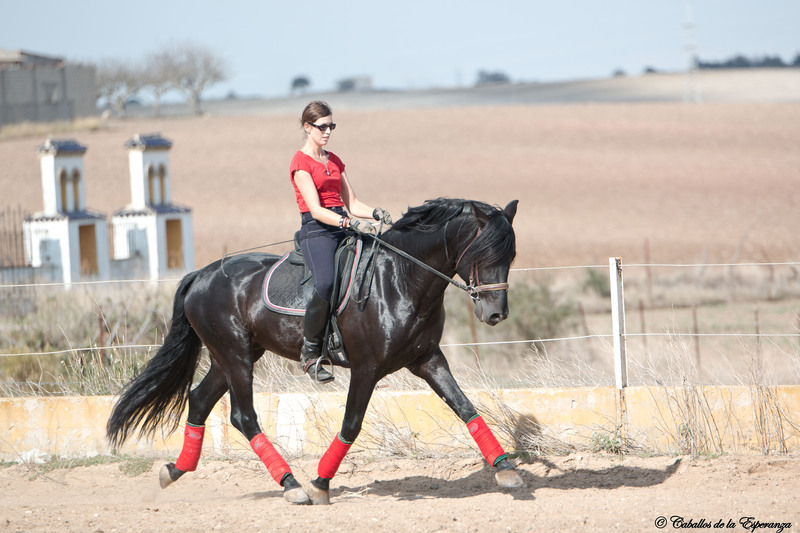 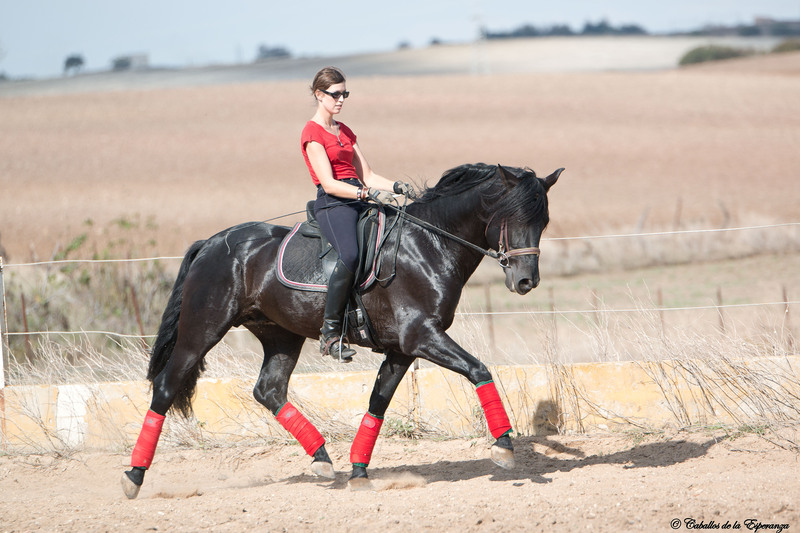 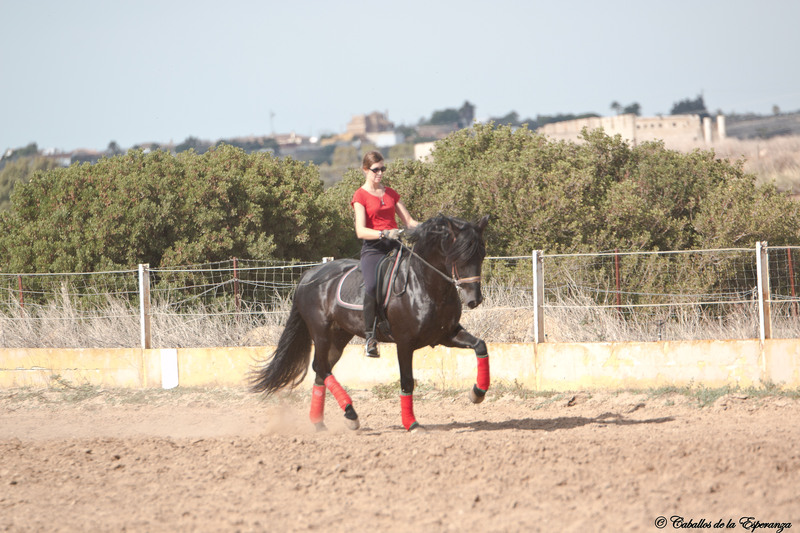 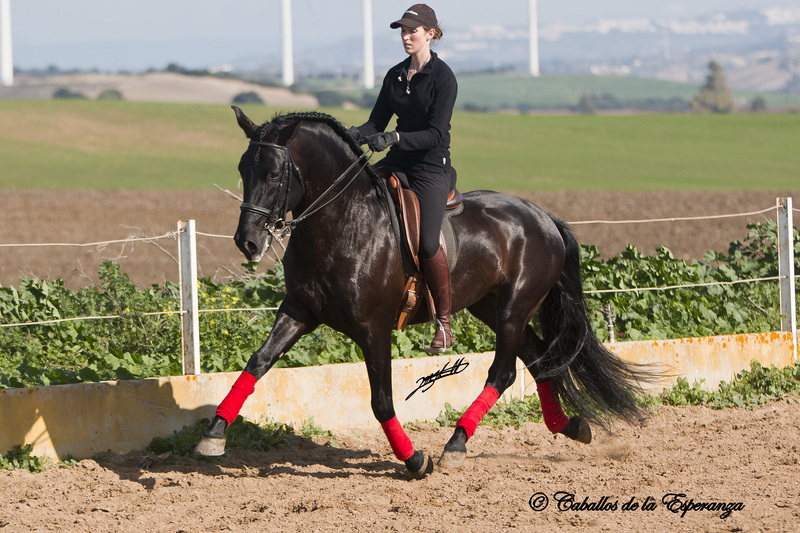 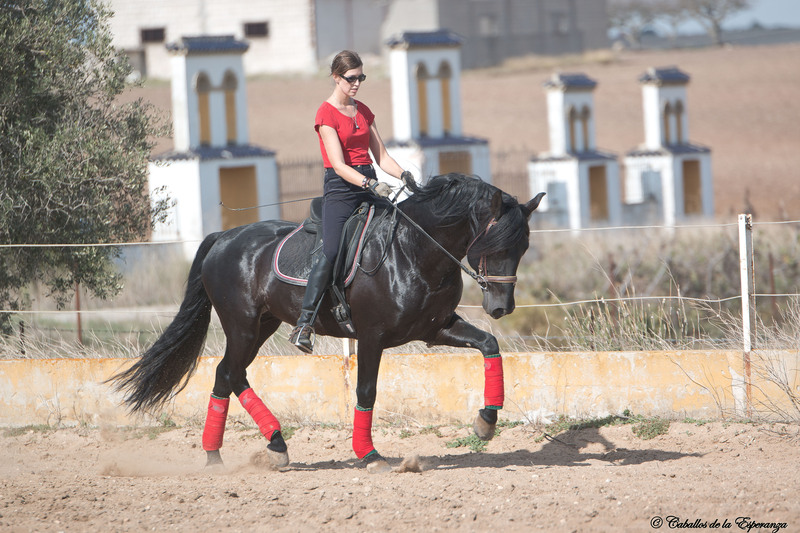 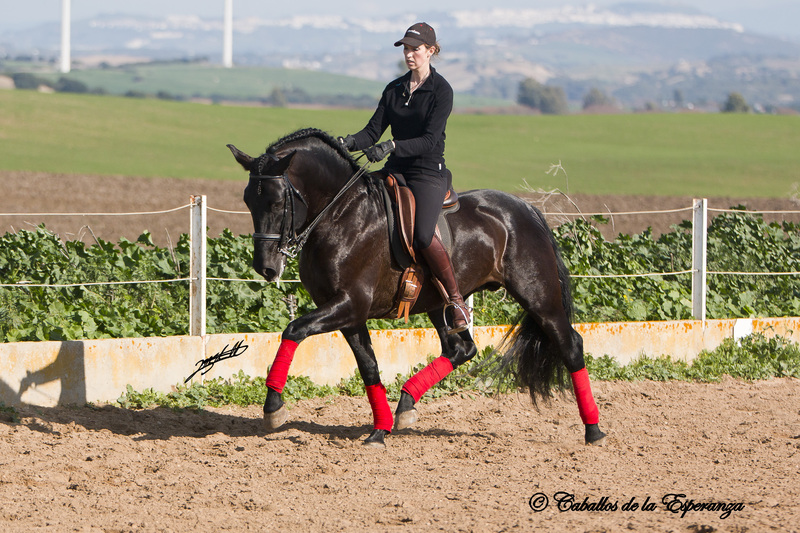 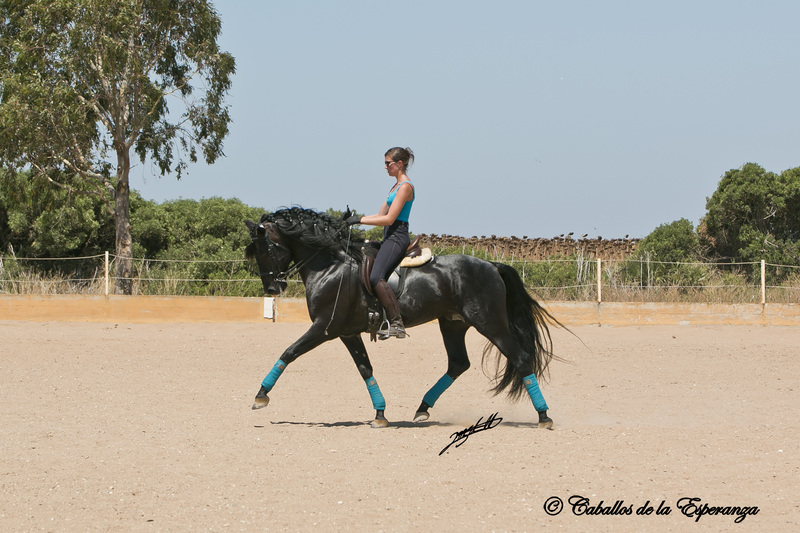 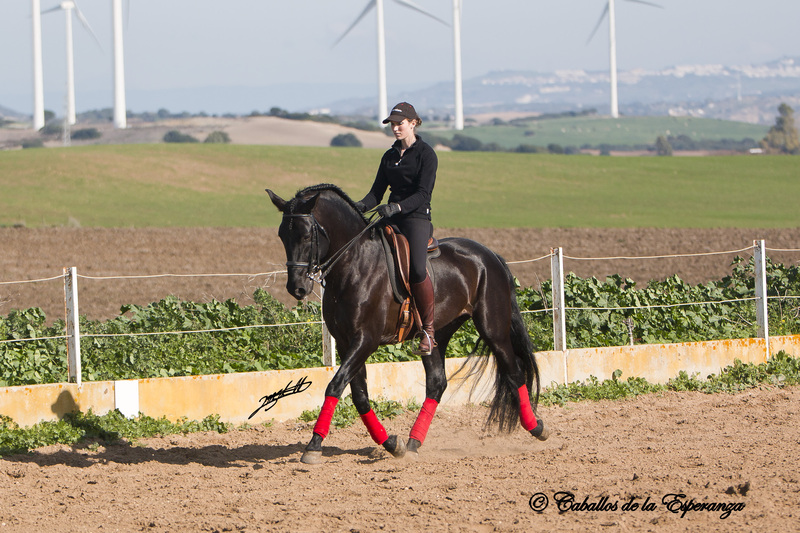 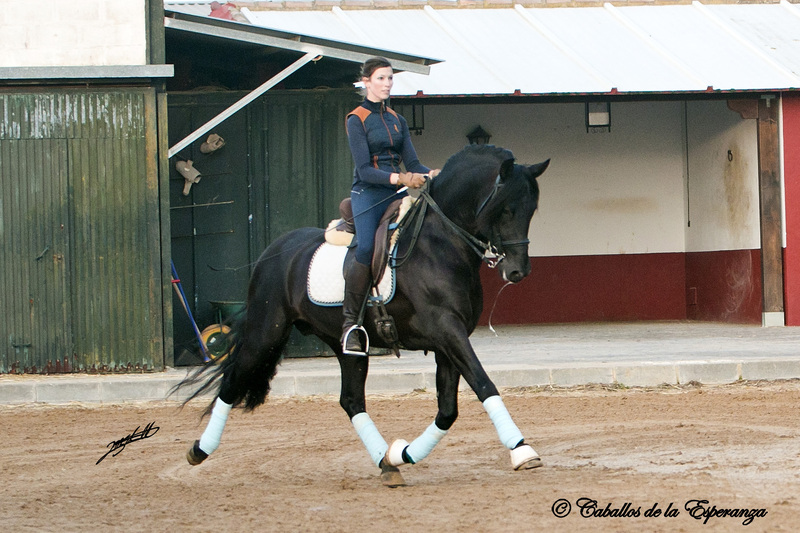 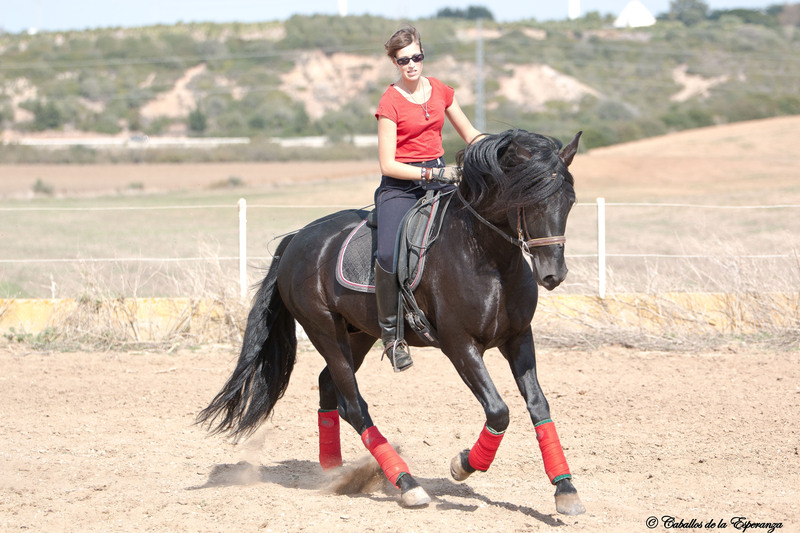 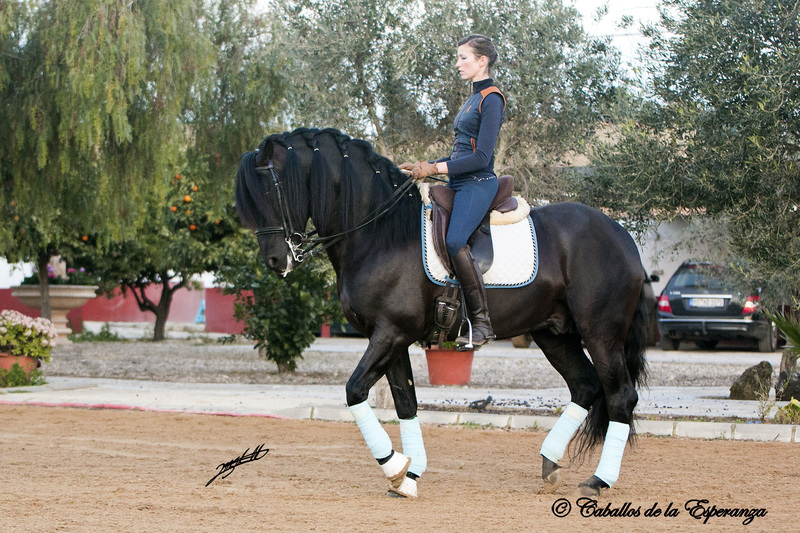 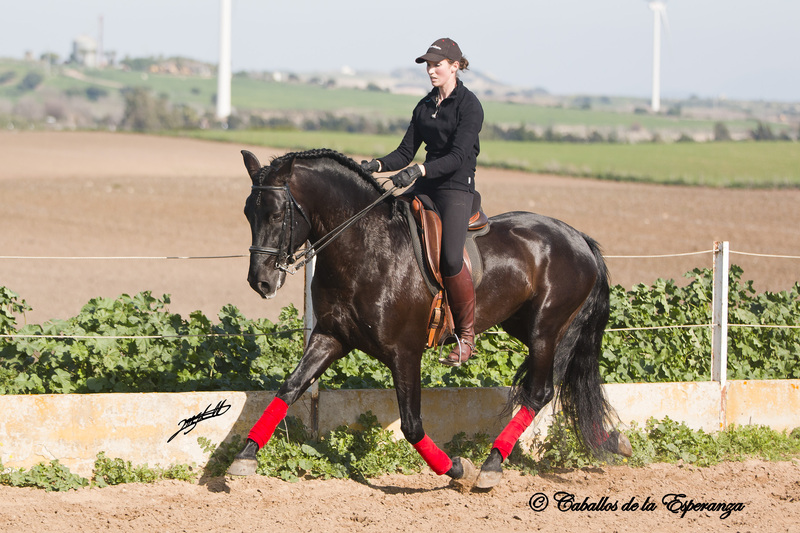 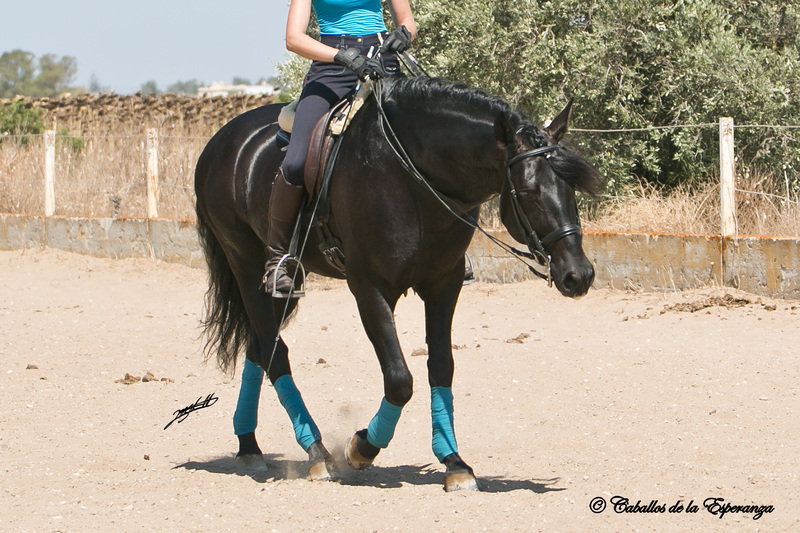 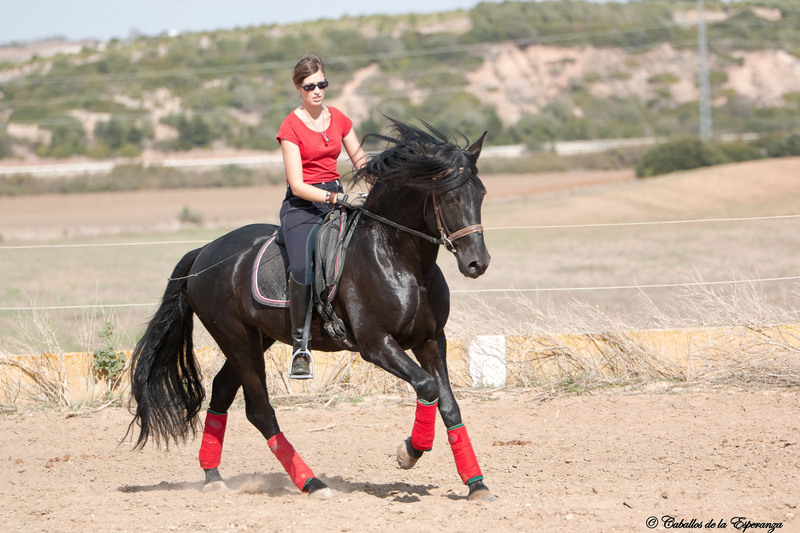 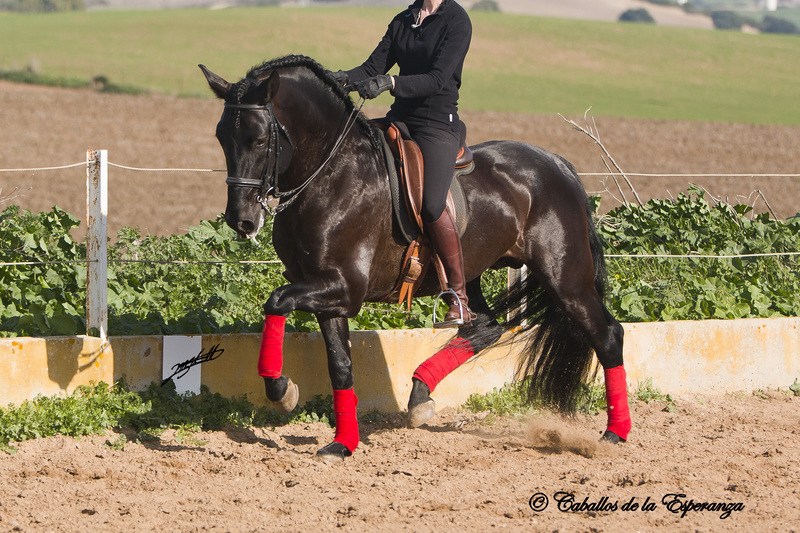 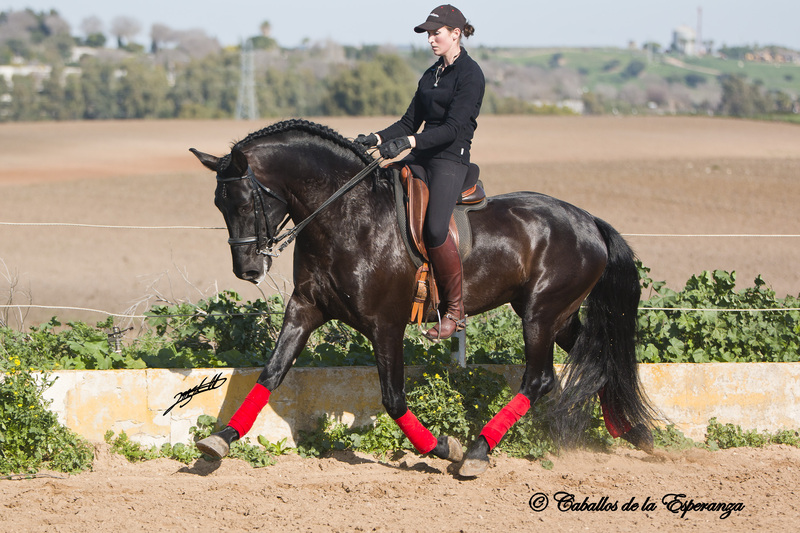 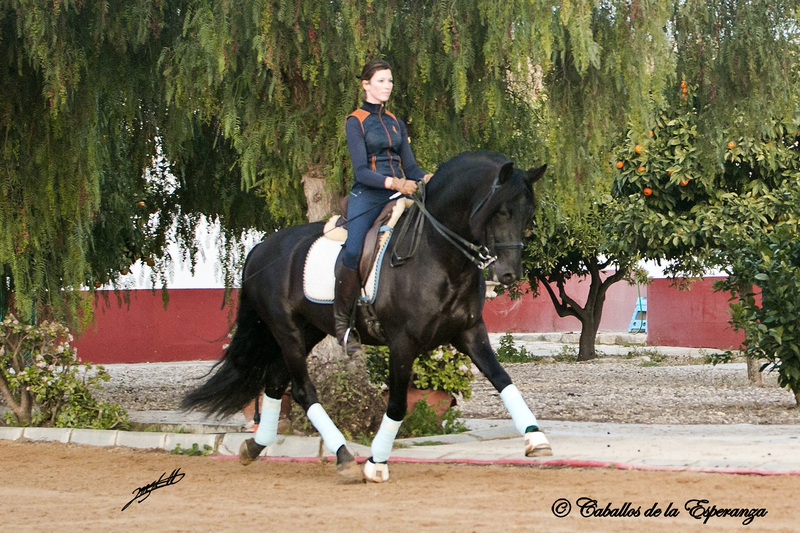 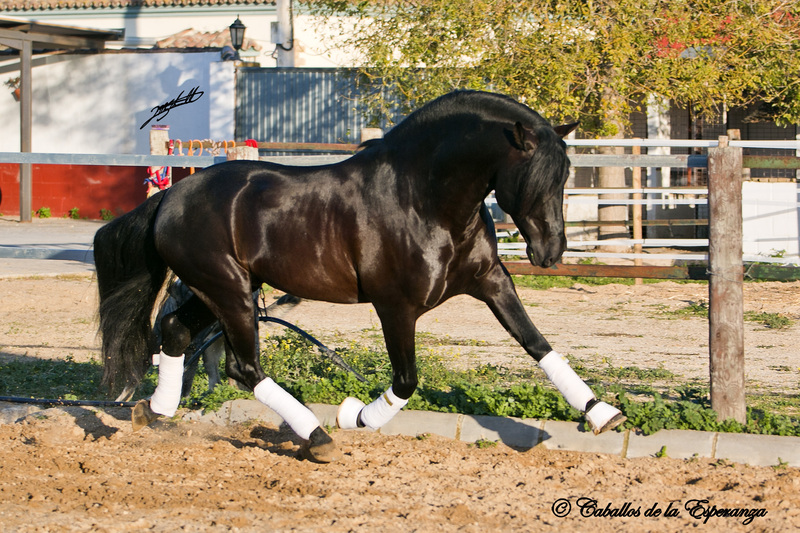 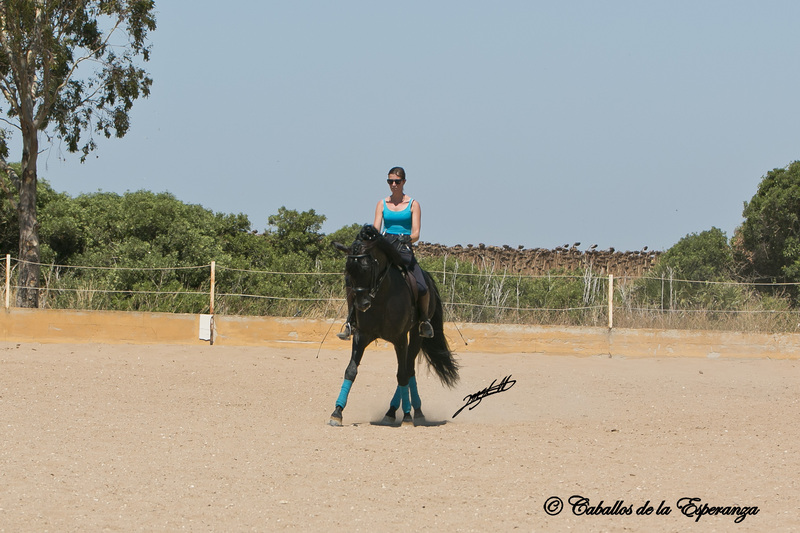 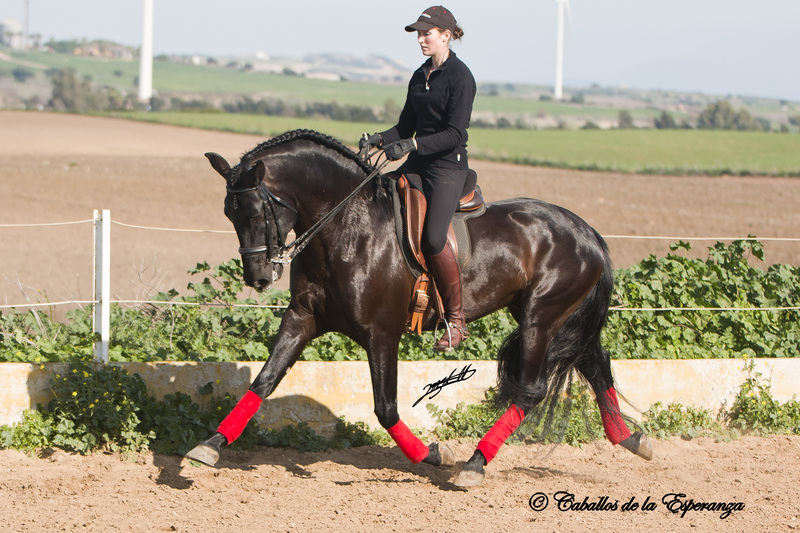 He knows all the lateral exercises, working-pirouettes and flying changes. 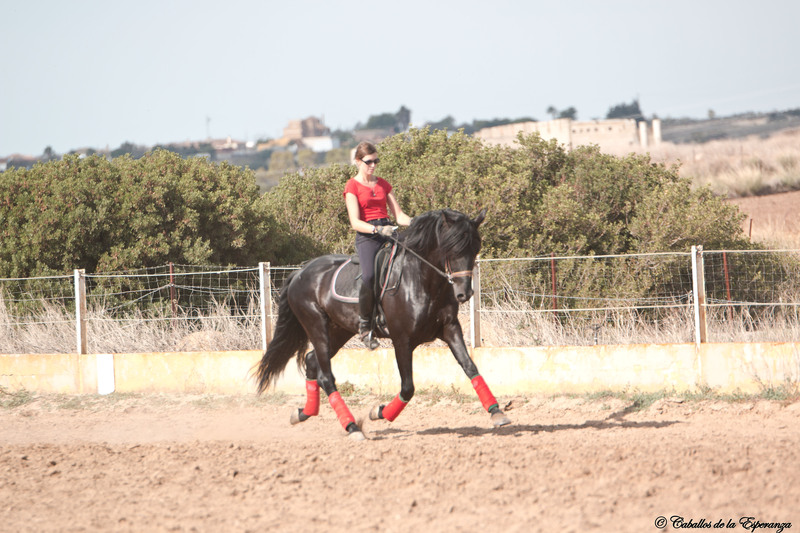 He is doing first changes every 4, 3 and 2 strides and even first one-on-one changes. 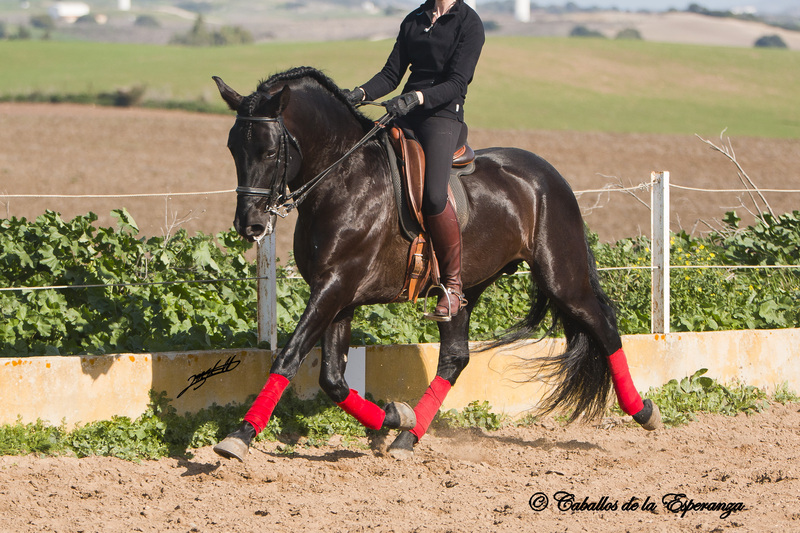 In hand he makes a very good Spanish Walk and nice piaffe steps. 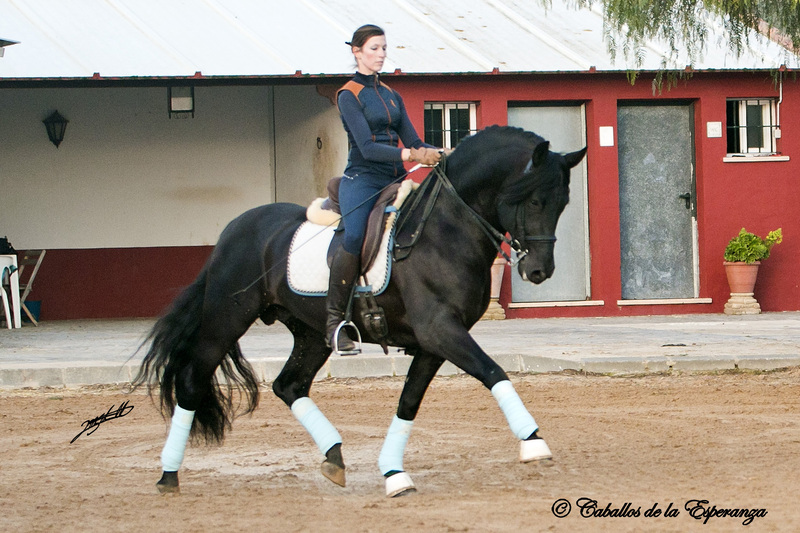 Under the saddle Spanish Walk, Piaffe and Passage are introduced. 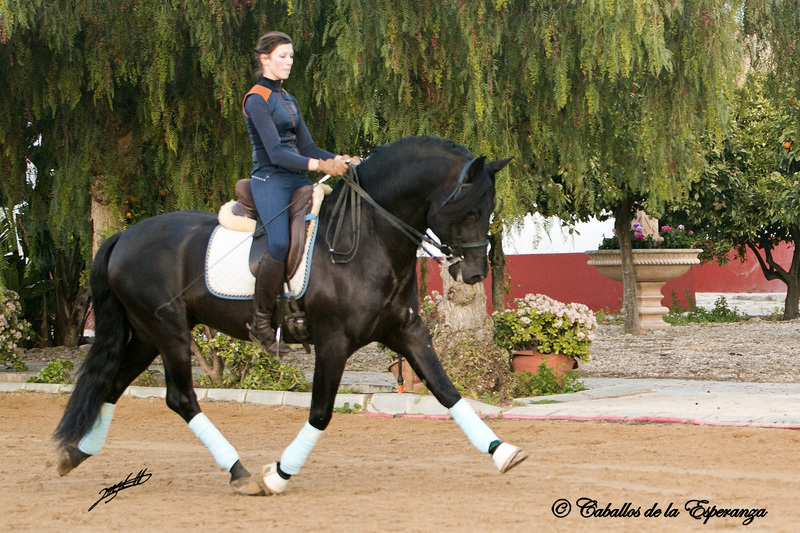 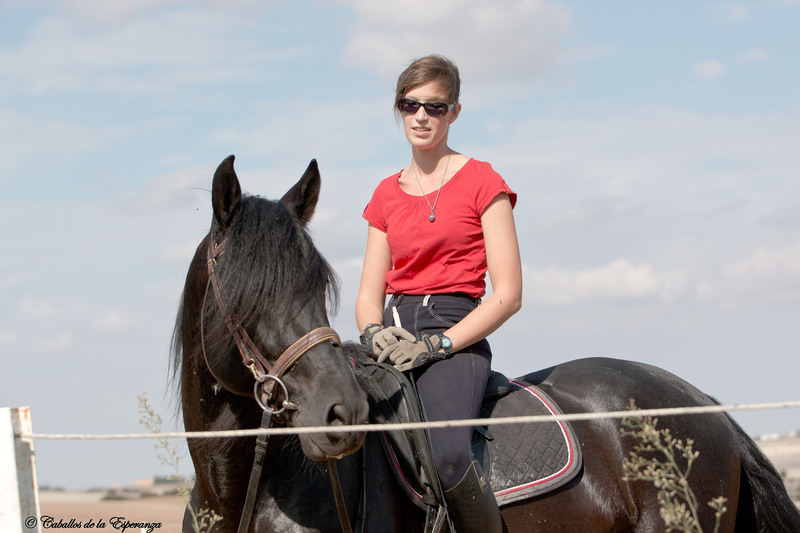 He has a very good walk and a good trot and canter with a very nice extended trot. 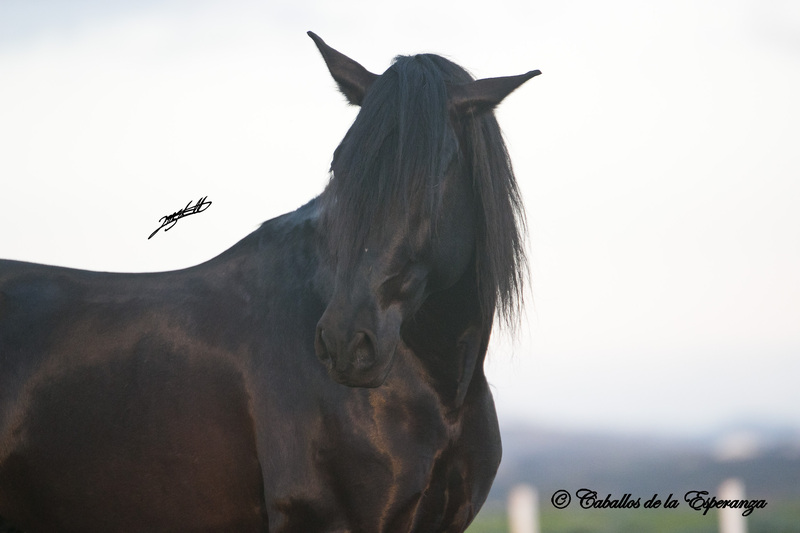 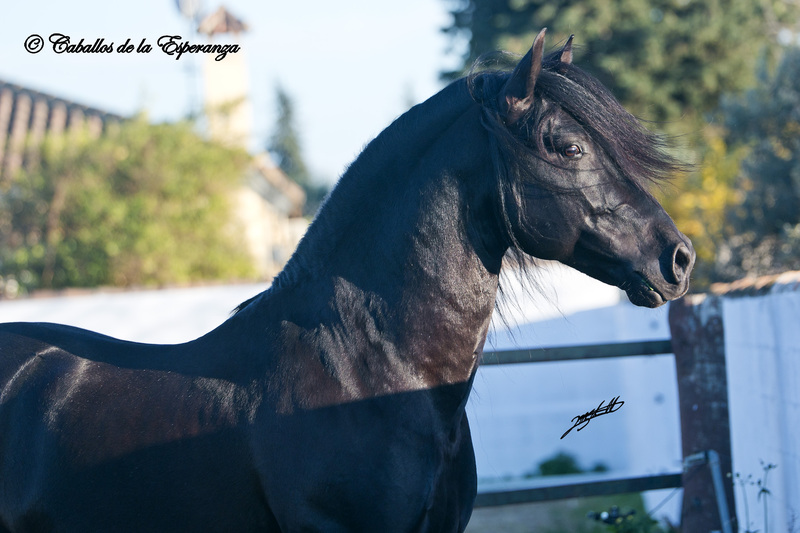 Distinguido is APTO approved and has already been breeding here at our stables (natural mounting) and we are so happy about his first offspring from the last (Freya) and this year. 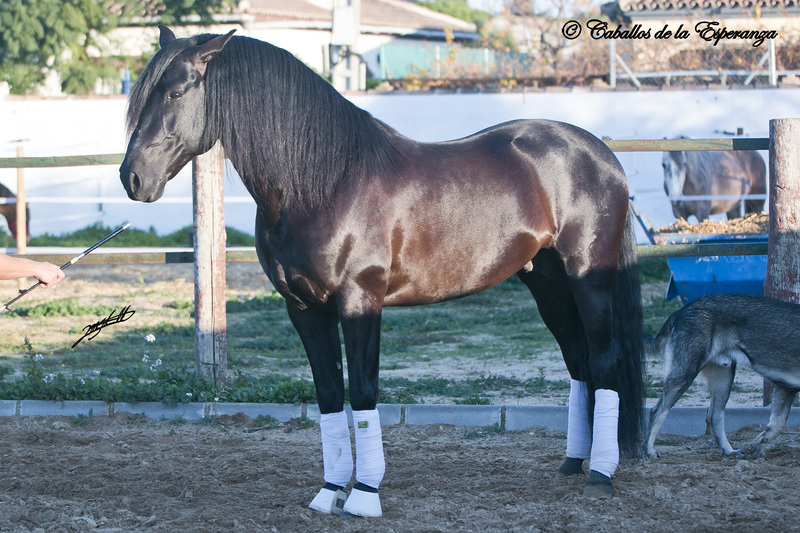 Information and pictures on request. 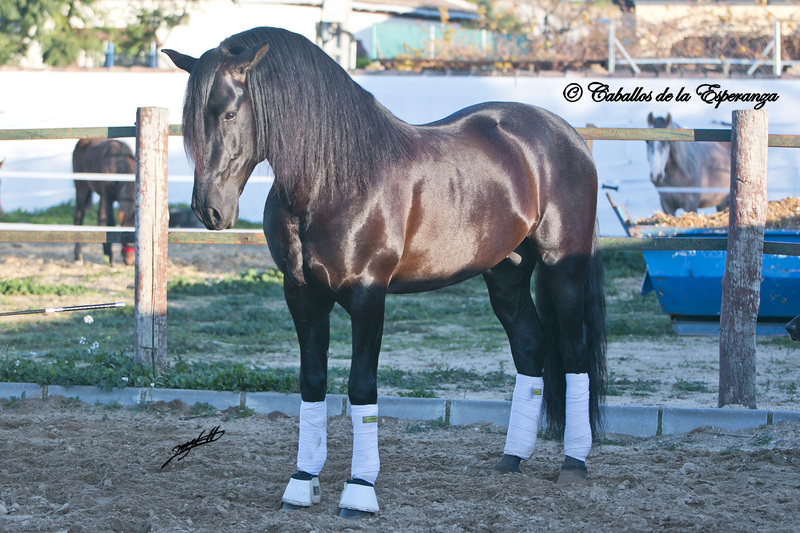 While mounting he is well-behaved and knows when he is going for covering and when not, so there is even during the breeding-season no problem to tie or work him next to mares. 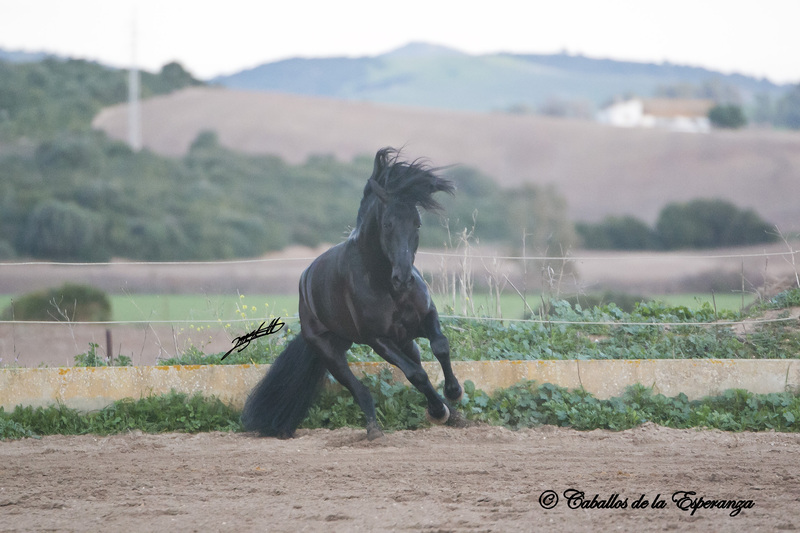 Generally he gets easy on with other horses. 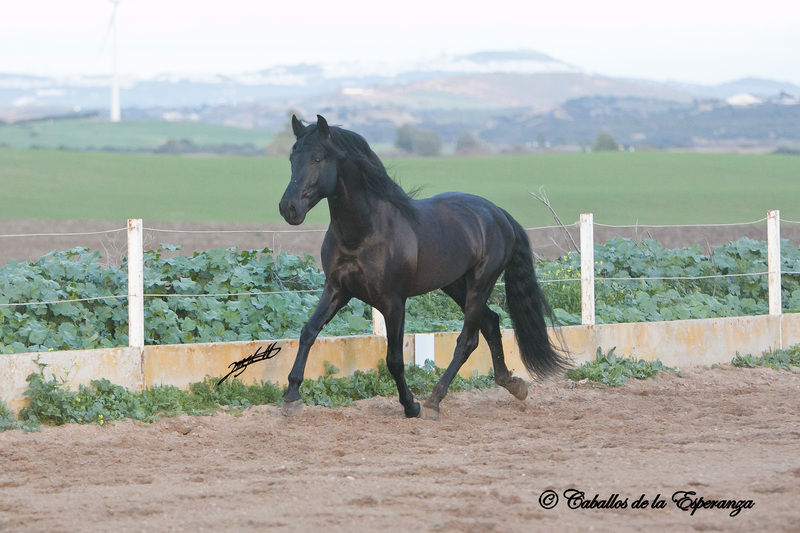 Also in the fields next to other horses (also mares) there is no Problem at all. 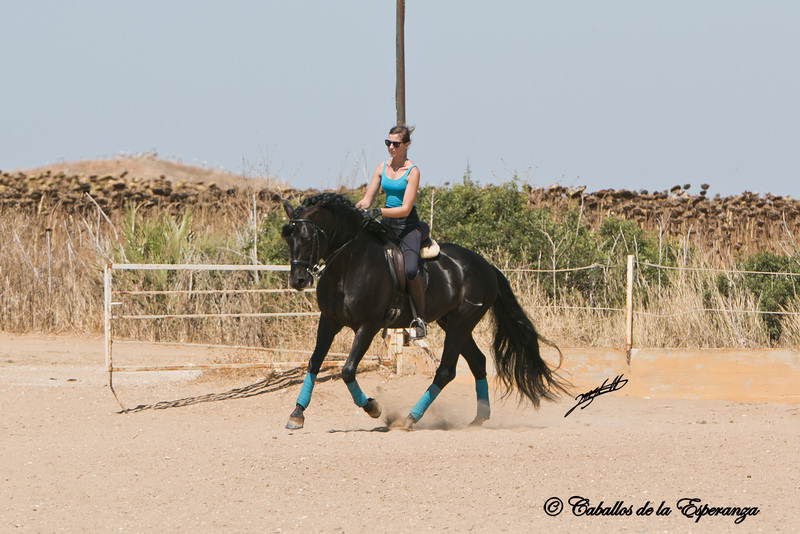 His behavior in the handling and under the saddle is really outstanding. 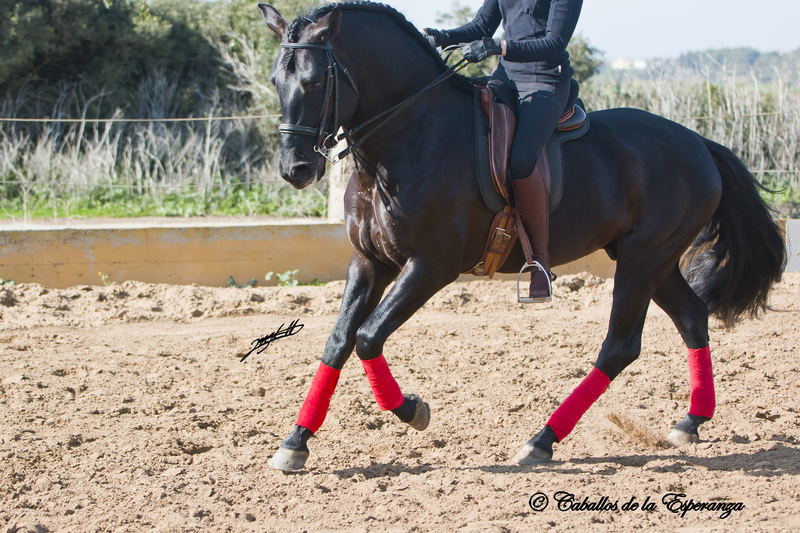 This is why he is suitable for any type of rider, from beginner to advanced rider. 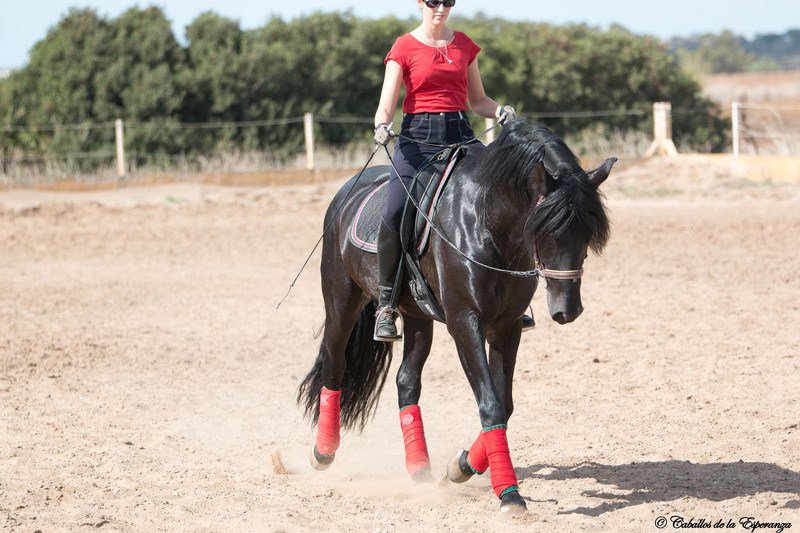 Here at our stables we give lessons with him. 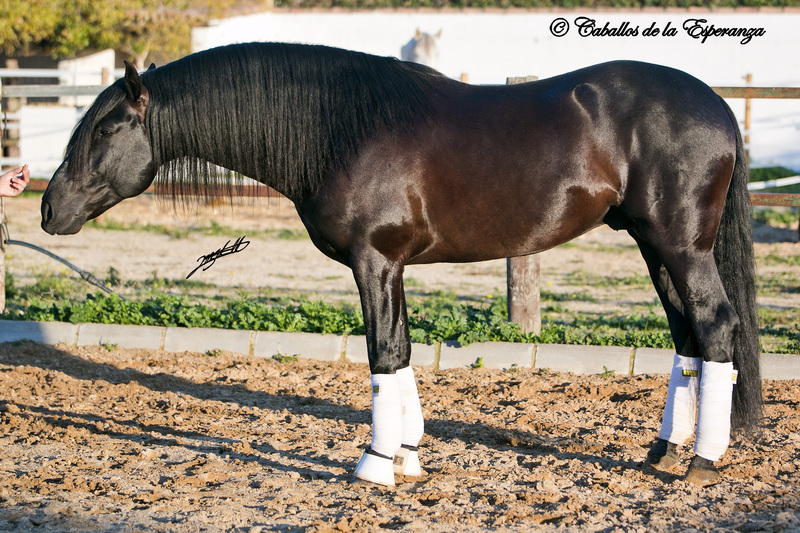 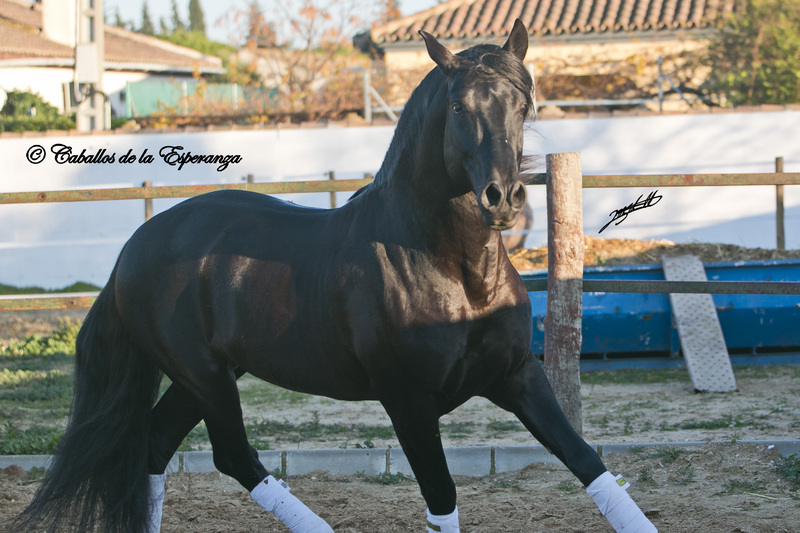 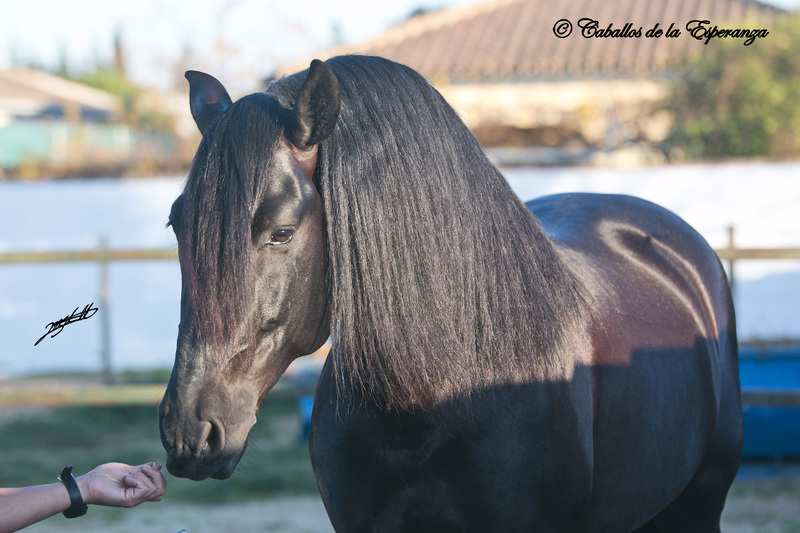 Here he shows his noblity with children or absolute beginners where he takes every step with care, and his power with advanced riders who can experience the feeling of flying changes, Piaffe, Passage and Spanish Walk with him. 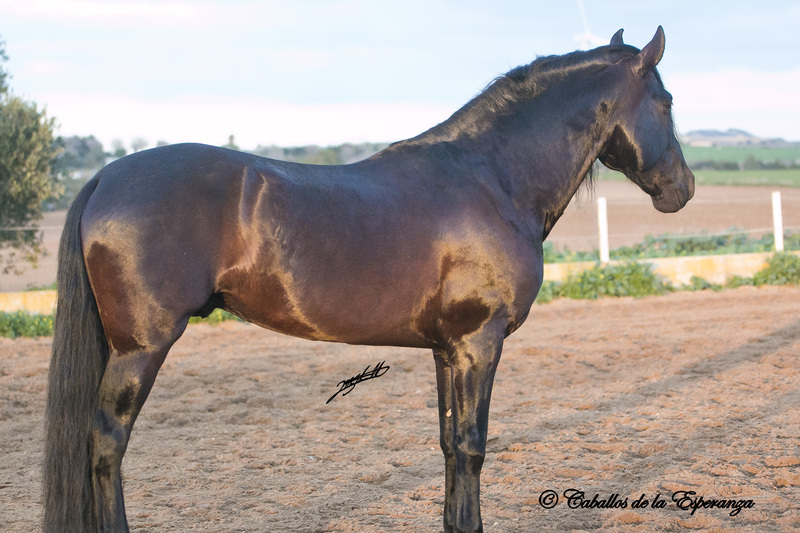 To handle and to ride him is a fantastic experience for everybody, because this beauty has them in love with him from the first second on!